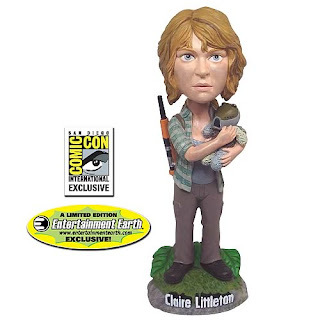 @BifBangPow: Lost Claire Bobble Head - SDCC 2010 Exclusive! Don't miss this all-new Entertainment Earth San Diego Comic-Con International exclusive! While the Man in Black may not need her to escape the island, you'll need her for your desk. The wonderful Claire Littleton bobble head stands 7-inches tall, is finely crafted of resin, and features superb detail that's accurate to the hit Lost TV series. And what's that thing in her hands? Limited edition of 1,500 pieces. Can't make it to Comic-Con? Order now for shipment after the convention (while supplies last). I can't wait to see Lost Juliet Burke Bobble Head or action figure. Will you release her in the next future? Why Claire? I want Juliet too!